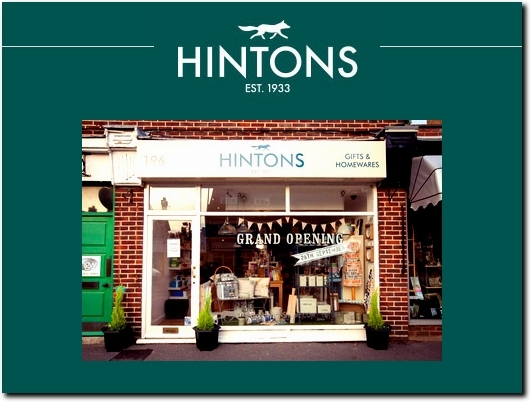 Dorset-based HintonsHome.com is proud to be a family run business with over 80 years experience so you know you are in safe hands when it comes to finding birthday gifts for her or him, wedding gifts and new home gifts - as well as that special something to decorate your own home at christmas or for the garden in the warmer months, Hintons has it all. UK (Poole, Dorest) based business - established in 1933, and with highstreet premises - providing homeware and garden products for sale. Website includes e-commerce facilities, terms and conditions (including delivery and returns information), testimonials (via trustedshop.co.uk), press mentions (dailymail.co.uk), full contact details. Company website has been online since 2011 according to web.archive.org.